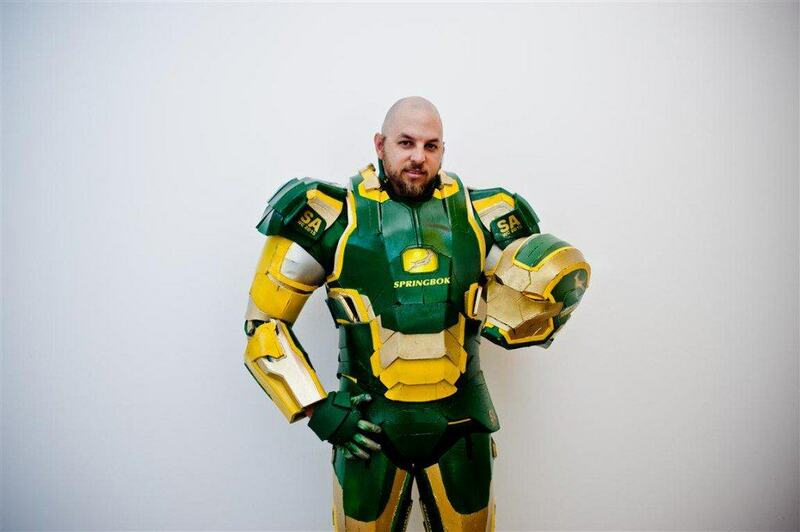 Meet Lance Eggersglusz, a 34-year-old fan of Iron Man and an avid Springbok rugby supporter who has his very own Iron Patriot armour, which he made himself! 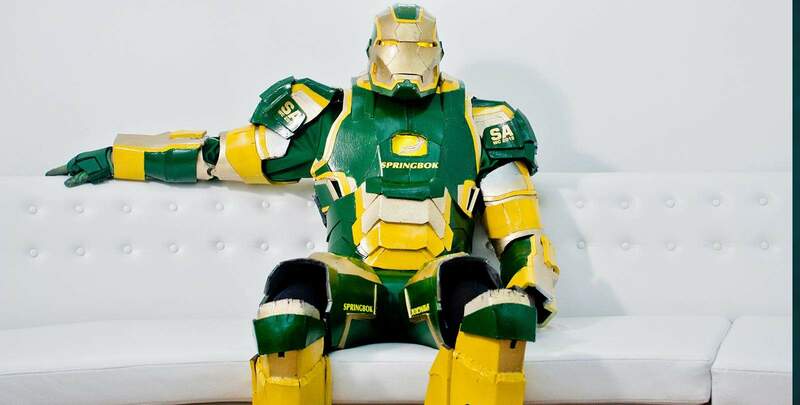 Eggersglusz, who hails from Durban North, Kwa-Zulu Natal, used his engineering and creative genius to combine his adoration for Iron Man and rugby into an incredible piece of uniquely green and gold South African cosplay. 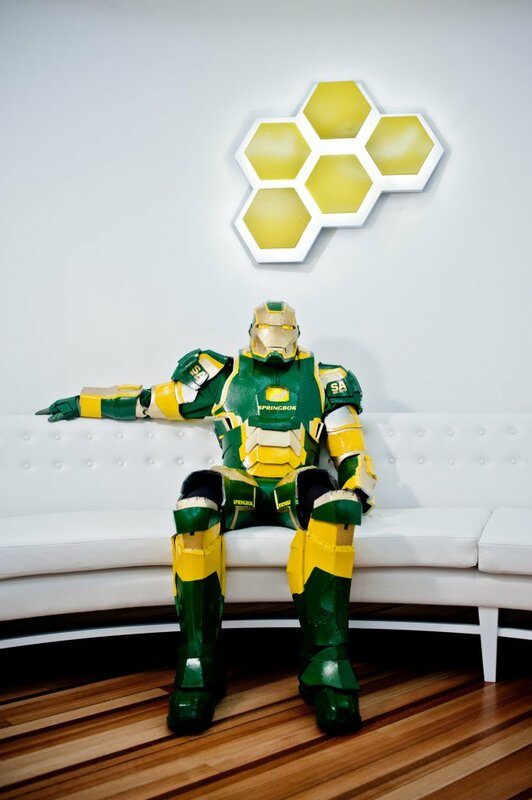 He originally designed the suit for a 3D-Design and Cutting course, having found the framework pattern for the Iron Man Mark II suit on the Internet, and continued to make the suit out of compressed foam, which took him around a month to complete in his spare time. He apparently loved every moment of the process, and it shows in the fantastic end product. Eggersglusz debuted his creation for the first time at the South Africa versus Wales Test match at Durban’s King’s Park stadium on 14th June 2015. Apparently the reaction he got from the crowds was so extreme that it took him over an hour to get to his seat because everyone was clamouring over him to take pictures. As a big fan of the Iron Patriot character from the Iron Man films, Eggersglusz said that he tried his best to not only replicate the suit, but to also give it a true and uniquely South African feel. 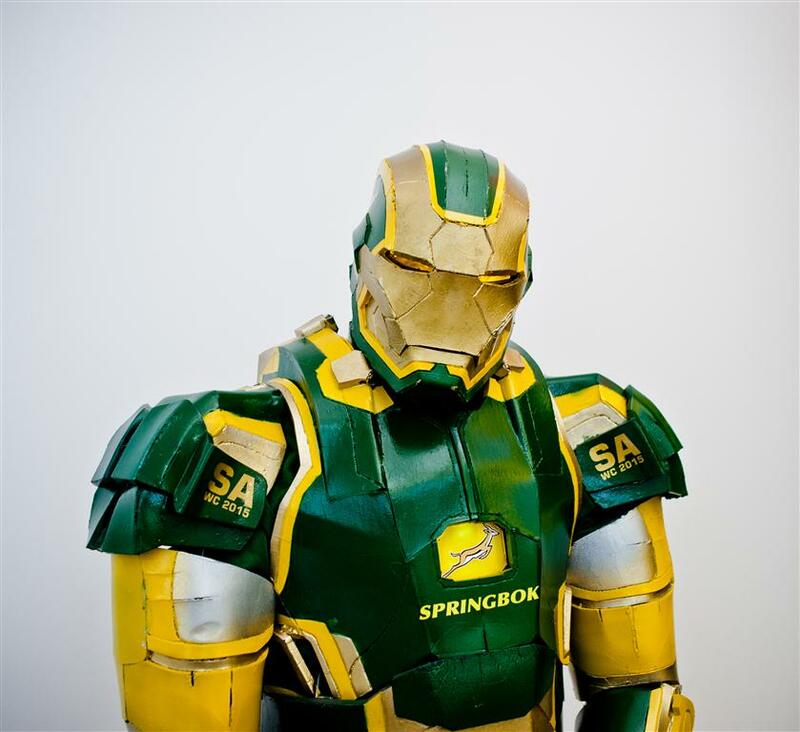 This resulted in him painting the suit in green and gold, which are the colours of the South African national rugby team. Along with a stunning paint job and incredible craftsmanship, Eggersglusz also took the time to ensure that the suit’s visor has eyes that actually light up, just like the actual Iron Patriot armour from the films, as well as a chest-piece that features a modified arc-reactor in the shape of the Springbok logo, which also glows. As an added touch, the suit he wore has not also been signed by Springbok legends JP Pietersen, Zane Kirchner and Flip van der Merwe. “It takes my family and I more than a hour just to get from our car to our seats if I go to a match wearing this suit. And that is nothing compared to how hard it is trying to go to the loo during breaks” Eggersglusz said. Eggersglusz has plans to use his new found popularity to brighten the lives of children and even hopes to start a “Superhero day” for charity. 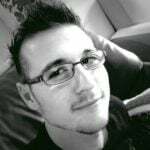 As such, he now has a dedicated Twitter profile (@SA_Ironman) where he posts updates regarding his suit and philanthropic endeavours.